Large research networks naturally form complex communities with overlapping but not identical expertise. To map the distribution of professional competence in field of ‘technology-enhanced learning’, the lexical semantics expressed in research articles published in a representative, large-scale conference (ED-MEDIA) can be investi-gated and changes in the topics covered can be tracked over time. Within this contribution, the two years 2000 and 2008 are used to con-trast the change in meaning structure. In both cases, first a quantita-tive investigation is applied, directly followed by a two-fold qualitative analysis. Results indicate that the field has opened up to new areas, thus diversifying research; at the same time, certain terminology dis-appears as interests shift and research is finalised for some of the un-derlying problems. Wild, F., Valentine, C. & Scott, P. (2010). Shifting Interests: Changes in the Lexical Semantics of ED-MEDIA. 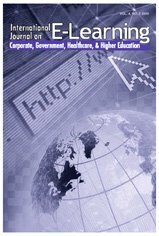 International Journal on E-Learning, 9 (4), 549-562. Waynesville, NC USA: Association for the Advancement of Computing in Education (AACE). Retrieved April 20, 2019 from https://www.learntechlib.org/primary/p/31386/.